I haven't always been the biggest fan of shellfish. I had a traumatizing experience as child involving a poorly cleaned clam that left me with a mouthful of gritty specked clam flesh. I was a kid at the time and temperamental so I refused to give it another try until several years down the road when that memory had somewhat faded. Gritty shellfish still remains one of my pet peeves (for lack of a better word I can think of at the moment) which is why I say a little prayer when I do eat out that it has been cleaned and soaked properly. EK and I are however now big shellfish lovers. It's so quick, simple and fuss free to prepare. A short trip to your local fish shop for what's in is always a nice departure from the gargantuan impersonal supermarkets. Since I live up in Carmel Valley area(by the 5 and 56), the closest shop to me would be The Fish Market by the Del Mar Fairgrounds/Racetrack. I really like the quality, variety and service here. I talked to the fish monger about what my plans for the shellfish were so he recommended manila clams and green mussels. I usually order about 2 x's more clams than mussels since they are more heavier and I also tend to like to eat them more. EK complains that I can be a little methodical and stringently follow a recipe sometimes, not allowing myself to be more free and creative. HAH! I had all of the below ingredients leftover from cooking this past week so I decided to throw them together and ta-dah! We steamed some jasmine rice to accompany the shellfish and soak up the yummy shellfish flavored, coconut-y curry. The rice did turn out to be what we felt was a necessary side. The curry mixed with the rice was just plain delicious and I felt content eating it even after all the shellfish was gone. Clean and soak shellfish thoroughly to make sure all the grit is gone. Place wine, curry powder/paste, lemongrass and scallions in pan. Heat and stir to desolve the curry. Heat medium-medium/high till alcohol is gone. Place heavier shellfish into pan first as this will take longer to cook. Cover and shake pan from time to time. Place lighter shellfish 2 to 3 minutes in as these should take a shorter time to cook. Take out shellfish as they open so they don't overcook. Complete cooking time should take 4-6 minutes at medium/high. Arrange shellfish on serving plate with some depth or a lip to hold the liquids in the end. Pour liquids from the pan through a strainer into a bowl. Discard lemongrass and scallions. Mix liquid with coconut cream, chopped cilantro and slice red chili. Add ground black pepper to taste. Pour over shellfish and you are ready to dig in! this looks delicious! I will have to give it a try this weekend. Thanks! Yum! I love the combo of lemongrass and coconut curry. 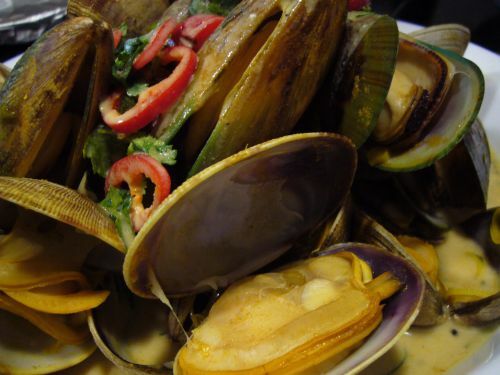 When I was in Vietnam a few years ago, my cousin took me to a seafood restaurant that had this sauce on spiral snails. The bottoms were cut out to absorb the sauce or to facilitate sucking? Who knows? I slurped it all up. Yummy... I have friends who have also been traumatized by bad shellfish....all it takes is "one bad clam!" Thanks for stopping by! Hope it turns out good for you. Ooo.. Vietnam! I've been wanting to go there. Hopefully I'll get to soon. I hope I don't ever get another "bad clam".